Anti-Inflammatory: What Foods Should You Avoid with Rheumatoid Arthritis? Rheumatoid arthritis is an inflammatory disease for which there is no known cure. Conventionally, patients follow a varied medication plan to help control inflammation, alleviate pain, and ultimately stop disease progression. However, diet and exercise can also play a role in helping maintain overall health and possibly reducing inflammation. By eating specific anti-inflammatory foods for rheumatoid arthritis, you can help ease inflamed joints and manage pain. Though diet alone cannot cure or treat rheumatoid arthritis, the right one can improve overall health levels. By choosing your diet carefully, you can add in more foods that help lower inflammation, and eliminate foods that are thought to increase inflammation. In addition to fighting inflammation, certain foods are better for improving bone and joint health and boosting the immune system’s function, which is important for patients with rheumatoid arthritis. Foods that contain omega-3 fatty acids, antioxidants, and fiber have been shown to help lower inflammation levels. Omega-3 fatty acids are found in fish and certain dark green vegetables. Walnuts, almonds, and flaxseed are also high in omega-3 fatty acids. Fresh fruits and veggies, as well as nuts and green tea, contain antioxidants to help improve joint pain and reduce inflammation. Fiber from fruits like apples and strawberries as well as beans and whole grains can help with digestion and lower inflammation. One of the most well-known food types for fighting inflammation is fish. Fish contain a nutrient called omega-3 fatty acids within their oils that some researchers feel are a natural ingredient that can moderate the inflammatory process. Opt for a diet that’s rich in fatty fish like salmon, tuna, herring, and mackerel. By eating at least one full 8 ounce serving of fish per week, you may begin to feel a decrease in inflammation over time. Fruits are a staple of any well-rounded diet. 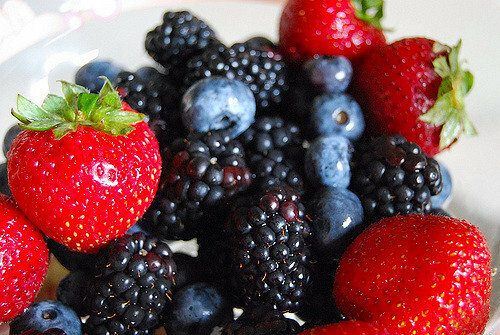 But fruits also contain natural inflammation-fighting nutrients and can help lower the risk of heart disease and manage weight. With anti-inflammation properties, strawberries are an excellent food to help in arthritis pain relief. They’re rich in vitamin C and fiber and have shown to help lower cholesterol, boost the immune system, and regulate blood pressure. Cherries are often associated with arthritis pain relief because of their natural inflammation-fighting properties. Cherries contain anthocyanins which are an anti-inflammatory antioxidant that can also prevent heart disease and control diabetes. In recent years, blueberries have become synonymous with antioxidants. Blueberries are known to help prevent disease, improve heart health, increase bone health, and decrease inflammation. Certain dark green vegetables are high in fiber content and vitamin E, which has been shown to help lower inflammation levels through C-reactive protein tests. Fiber is also important in regulating the digestive system and contributing to overall better health. Spinach is an excellent source of fiber and antioxidants like vitamin E. These are both thought to be important dietary ingredients in helping reduce inflammation. Broccoli is a naturally excellent source of fiber and B vitamins as well as vitamin A. But broccoli also contains a flavonoid called kaempferol which is thought to help fight inflammation. Brussel sprouts are another dark green vegetable to add to your diet. High in fiber and omega-3 fatty acids, Brussel sprouts are excellent anti-inflammatory foods for rheumatoid arthritis. Adding whole grains to your diet is good for many reasons. Foods like oatmeal, brown rice, quinoa, corn and dozens more help to reduce C-reactive protein levels that are indicators of inflammation. If you’re looking for anti-inflammatory foods for rheumatoid arthritis be sure to cook with a variety of whole grains. Just as whole grains are important to a rheumatoid arthritis diet, so are a variety of beans and nuts. Beans like red beans and kidney beans are full of fiber and protein and can help boost the immune system and lower inflammation. Nuts are also excellent anti-inflammatory foods for rheumatoid arthritis as they contain a variety of nutrients and antioxidants specific to lowering C-reactive protein levels. Soybeans are a powerful food that are rich in calcium, B vitamins, fiber and omega-3 fatty acids. You can add soybeans to your diet with tofu dishes or edamame bean snacks. Some of the best anti-inflammatory foods for rheumatoid arthritis are nuts, and more specifically walnuts. Walnuts contain powerful and uncommon types of phytonutrients that are connected with lowering inflammation levels. Dietary research is proving the benefits of different natural cooking oils for improved heart health and reducing inflammation. This kitchen staple contains healthy fats and antioxidants like vitamin E, which have anti-inflammatory properties. Olive oils as a regular part of the diet can also reduce the risk of heart disease, which is often a potential complication of rheumatoid arthritis that patients must actively prevent. One of the most important health benefits of avocado oil is its ability to help fight inflammation, especially in autoimmune conditions. It also contains antioxidants to help boost the immune system. In addition to protecting the immune system and improving heart health, sunflower oil can help reduce inflammation as well. Sunflower oil is rich in fatty acids and can help regulate the body’s healthy fats. Green tea contains a variety of antioxidants known to boost immune system function and possibly lower inflammation levels. Green tea also contains specific antioxidants that are thought to prevent cartilage destruction. A change in diet can make a difference for many people with rheumatoid arthritis. Be sure to consult your doctor if you have any concerns over types of anti-inflammatory foods for rheumatoid arthritis.